A striking feature of the past two years has been the media’s eagerness to brand 1930’s era right-wing policies as the Next New Thing in U.S. politics. Wisconsin Republican Congressman Paul Ryan is deemed a visionary for joining New Deal era opponents of Social Security, and it took nearly a year for the media to identify Tea Party backers as solidly Republican. 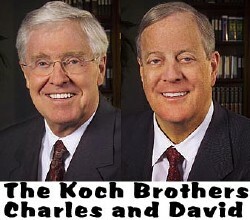 Even the notorious Koch Industries – run by the type of corporate plutocrats who battled FDR – are described in the October 19 New York Times not as selfish profiteers but as “longtime underwriter of libertarian causes.” Hedge fund manager Paul Singer, another large right-wing donor, is also described as “active in promoting libertarian causes.” But neither Singer, the Koch’s or any other of these right-wing plutocrats are supporting any candidate that supports abortion rights, gay and lesbian rights, and the legalization of marijuana – three core libertarian principles. Nor do their candidates oppose overseas wars, another longstanding libertarian view. The media has long sugarcoated agendas that will damage the finances and health of most Americans, and has now gone into overdrive re-branding and legitimizing the extreme right-wing. In campaign appearances, President Obama has taken to describing the basis of the Republican Party’s campaign as “amnesia. They figure you’re going to forget – because you’re angry about the situation.” While Obama is specifically referencing how Republican policies caused the current economic crisis, he could just as easily be describing the traditional media’s heralding of right-wing ideas as if they have not been tried and failed in the past. As Jane Mayer reported in her already legendary August 30 New Yorker story on the Koch brothers’ war on Obama, David Koch and his right-wing allies are spending record sums to ensure that economic and social inequality grows in the United States, along with corporate profits. The Koch brothers are financing California’s Prop 23 campaign to reverse the state’s historic anti-global warming legislation – and can pretty much be counted upon to oppose any measure that seeks to make our air cleaner, workplaces and environments healthier, and that prevents the richest 1% from taking at least 95% of the nation’s wealth. The question is why the media allows these selfish profit-driven billionaires to cloak their agendas behind a libertarian ideology that clearly does not apply. The Koch brothers have no problem with government regulating medical treatments such as abortion, or of waging a massive drug war, or prohibiting gay and lesbian marriage or denying the civil rights of non-heterosexuals – in fact, the candidates they fund oppose such libertarian policies. When people adopt libertarianism just for economic policies, they should not be classified as “libertarians.” Instead, they should be identified as people for whom the drive for personal profit is the exclusive goal, and who have no interest in the economic or spiritual health of the nation. Reagan’s Next New Thing came from the playbook of Republican opponents of the New Deal. By allowing him to re-brand it, the media contributed to the political pressure to give Reagan a chance to at least try this “new” policy out. That’s how trickle down economics became the nation’s “new” economic policy, predictably leading to greater inequality and the 1987 Savings & Loan meltdown. We saw the same game played with the Bush tax cuts of 2001, and now with the Republican economic agenda in the 2010 campaign. Karl Rove, the Koch brothers, FOX News and other Republican power-brokers know that regardless of how often they re-brand failed policies designed solely to benefit the rich, the traditional media will not only buy their new framing hook, line and sinker – but help promote and legitimize it.